Mac-Lander, Inc. services were created to provide both the prospective and established trailer end-users with the information they need. Through our dealer network of established Mac-Lander trailer outlets you can locate the dealer nearest your location. 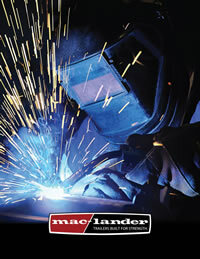 Once you have purchased your quality Mac-Lander trailer, customer service does not stop there. Our trailer warranty is among the strongest in the business. We stand behind our product. Mac-Lander trailers come equipped with many important features, however one of the most crucial is the Operator’s Manual new owners receive upon purchase. Take the time to read this easy-to-use, comprehensive manual thoroughly. It will provide owners and operators with maintenance procedures and detailed instructions for safe, efficient, and trouble-free operation of their trailers. Should a brake problem arise try our Troubleshooting Guide to find the answers you need. You will also find some very helpful knowledge that will make each outing with your new Mac-Lander trailer a little safer. Think Safety! !